I’m doing the Hula, aren’t you? Right now. Me, grass skirt, waving my arms. Everyone loves barbecued chicken, right? That’s where this recipe for Pineapple Chicken starts. 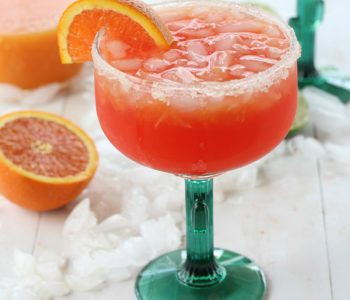 Don’t worry, though, once we are finished, you end up with a Hawaiian inspired flavor. 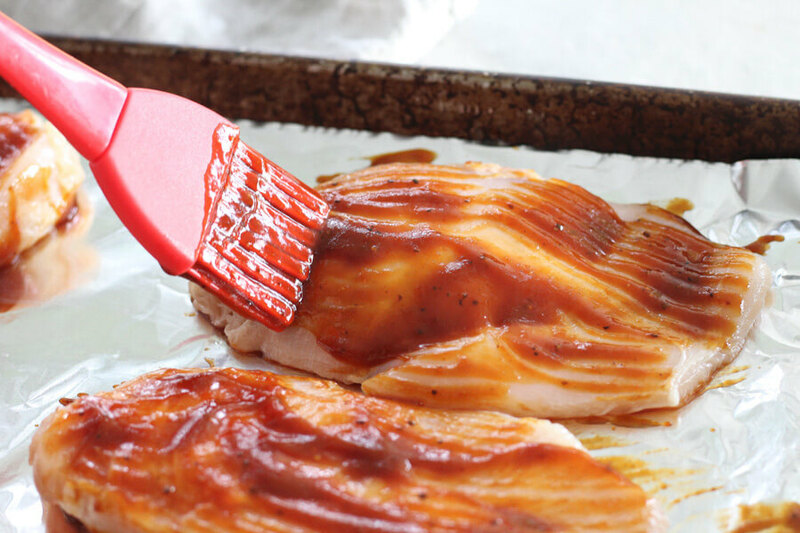 For this baked chicken recipe, start by generously brushing chicken cutlets on both sides with a thick and sweet barbecue sauce. Use any kind you like, but thick works best. 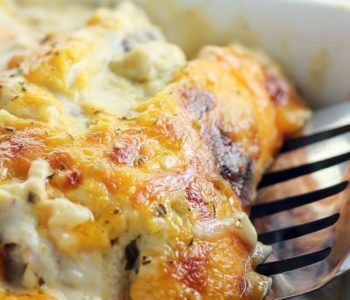 The trick to getting this chicken to cook perfectly is a hot oven and thin chicken breast cutlets. We used 3 large chicken breasts (about 10 ounces each), and cut them in half lengthwise to create thinner pieces. 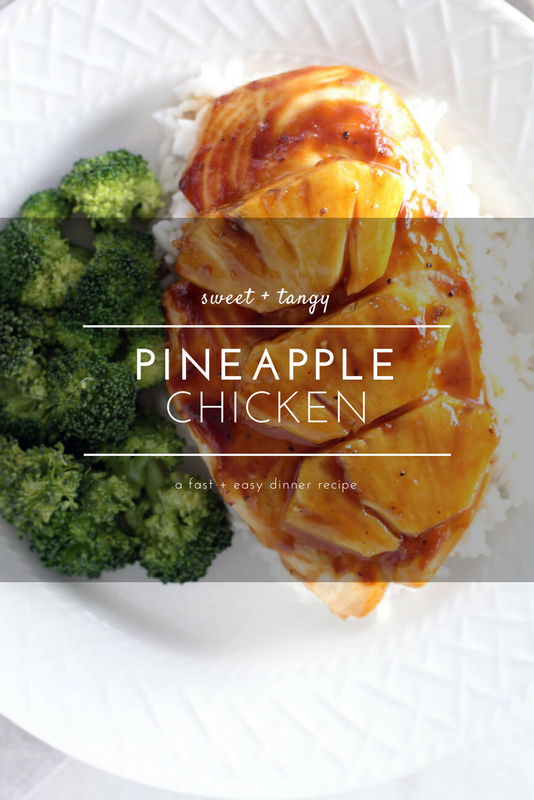 Next step to making Pineapple Chicken is to top each piece of chicken with three pieces of pineapple. (You can certainly add more if you’d like.) 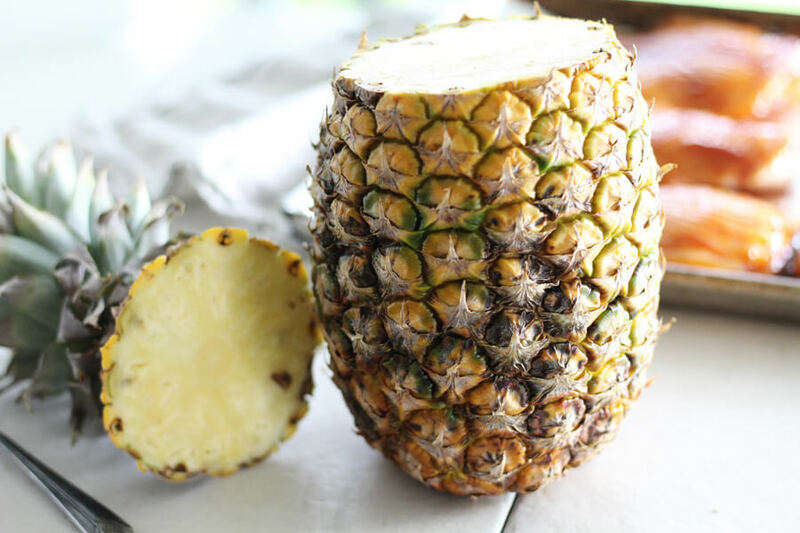 While the chicken cooks, the pineapple will broil and the juices drip down onto the chicken making it moist. 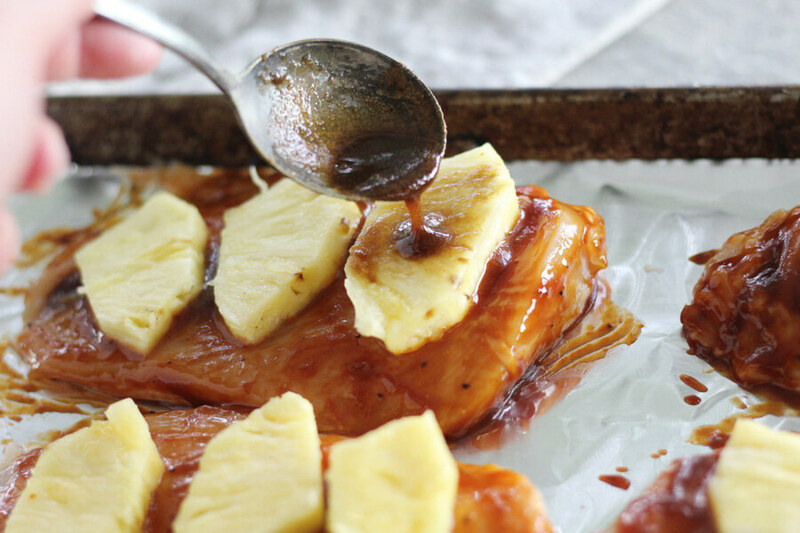 Brown sugar and soy + pineapple = delish. Evenly spoon the brown sugar mixture over the pineapple. Don’t worry, it isn’t too sweet. The soy balances out the sugar. 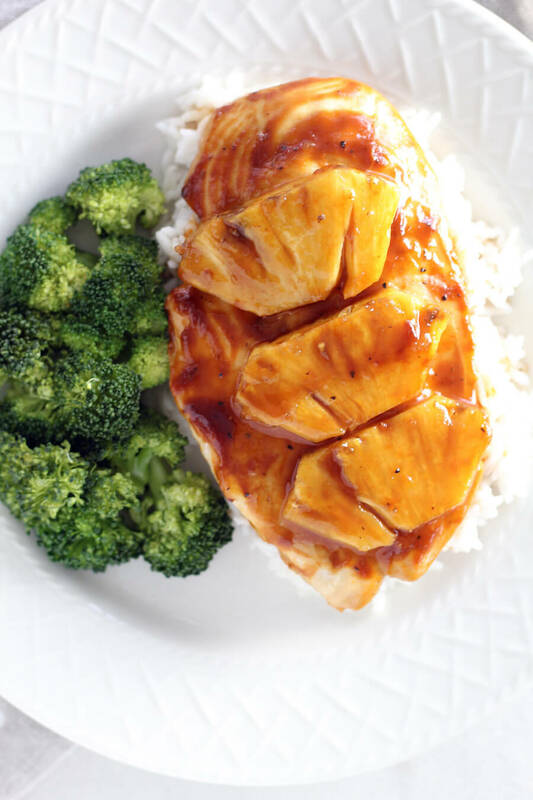 The flavors of brown sugar, soy, pineapple and barbecue sauce create this amazing sauce while the chicken cooks. And you don’t have to lift a finger. 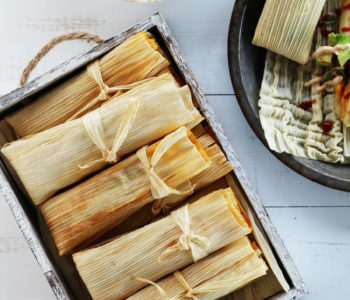 This is what you should have before baking. Six beautiful chicken cutlets all sauced and fruited and ready for the oven. Can you wait 20 minutes for the result? 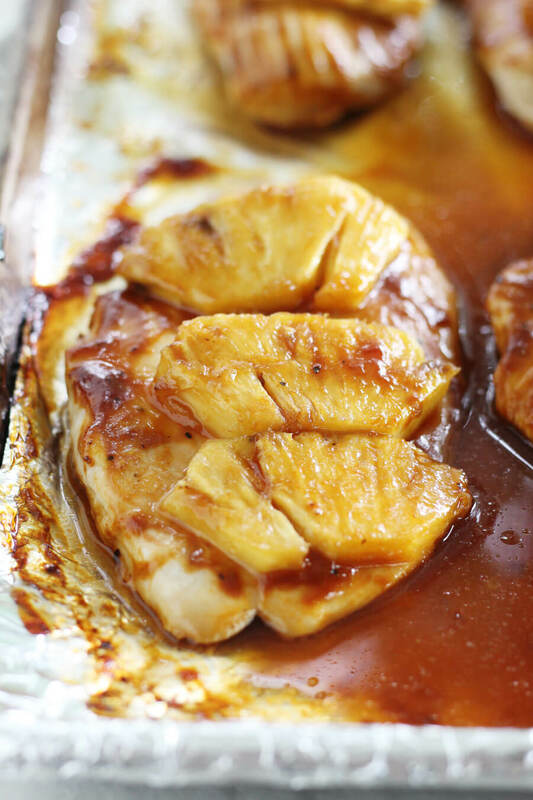 For the best results, baste the Pineapple Chicken during the last few minutes. 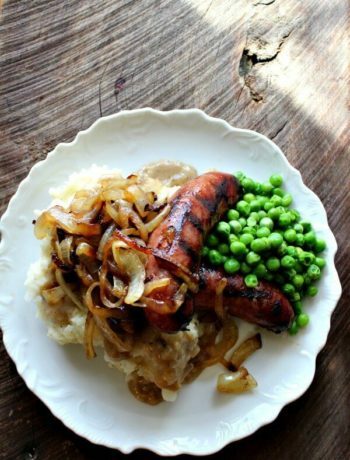 Simply tilt the pan slightly and spoon some of that sweet-savory sauce over the top. 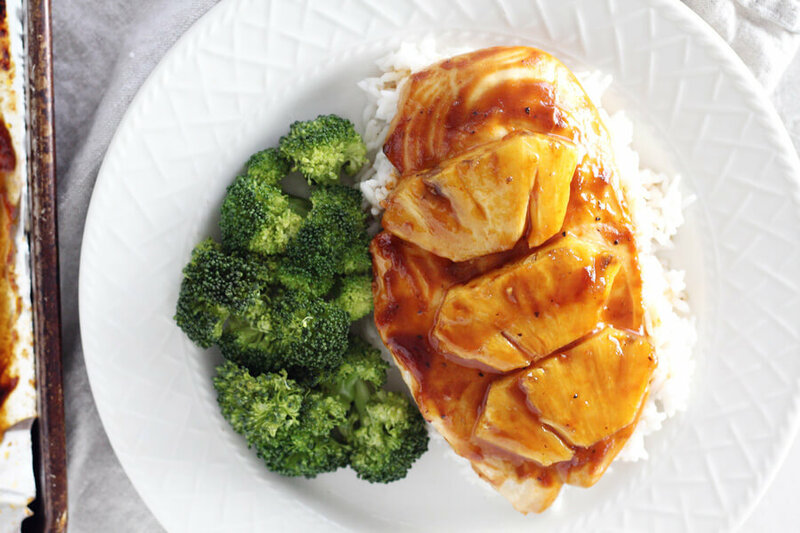 Who is ready to eat Pineapple Chicken? 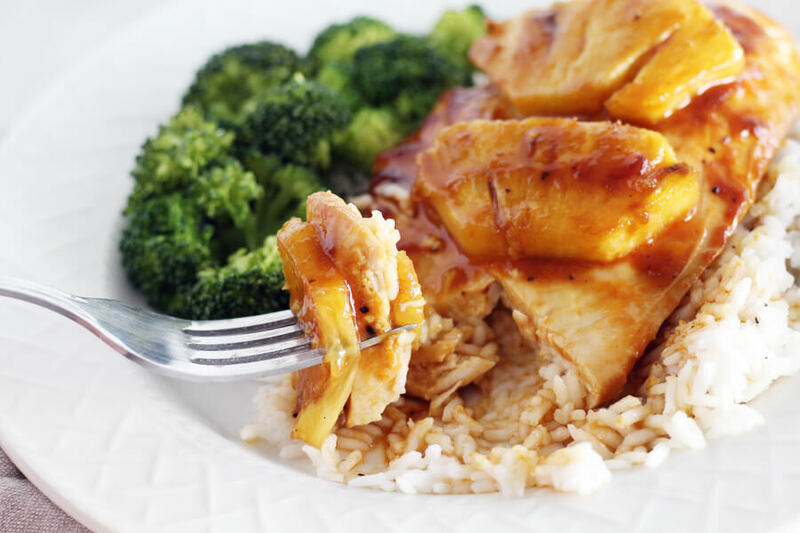 This chicken dinner recipe is perfect served with steamed vegetables, stir fry and rice. 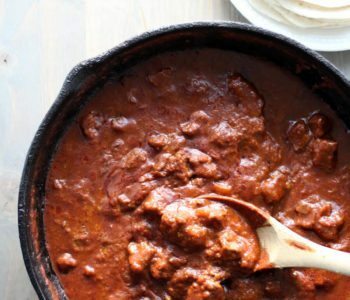 Serve with a generous serving of the pan sauce for an extra delicious touch. 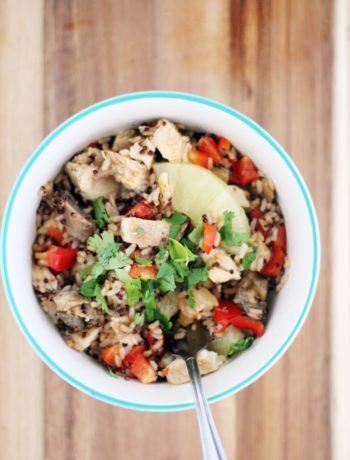 If you are looking for a side dish to try, how about Soy + Black Pepper Mushrooms or Baked Lemon Rice? Cut chicken breasts into cutlets. Brush both sides with sauce of choice. Spoon brown sugar + soy mixture over the top. Rest for 5 minutes and enjoy! 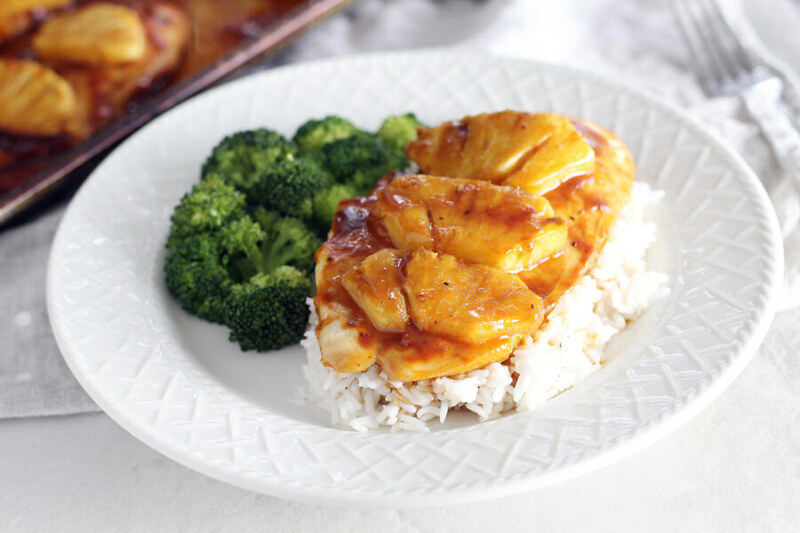 Using only 5 ingredients, this fast and delicious recipe for pineapple chicken will soon become a weeknight family favorite. 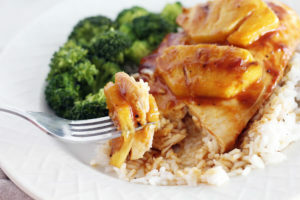 Tangy sweet pineapple with a blend of sauce, brown sugar and soy makes a perfectly tender, moist baked chicken entree. Preheat oven to 425 degrees. Line a rimmed baking pan with foil. Cut chicken breasts in half lengthwise to make 6 cutlets. 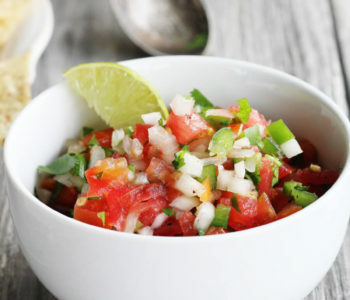 Brush both sides generously with barbecue sauce, using about 2 tablespoons per cutlet. 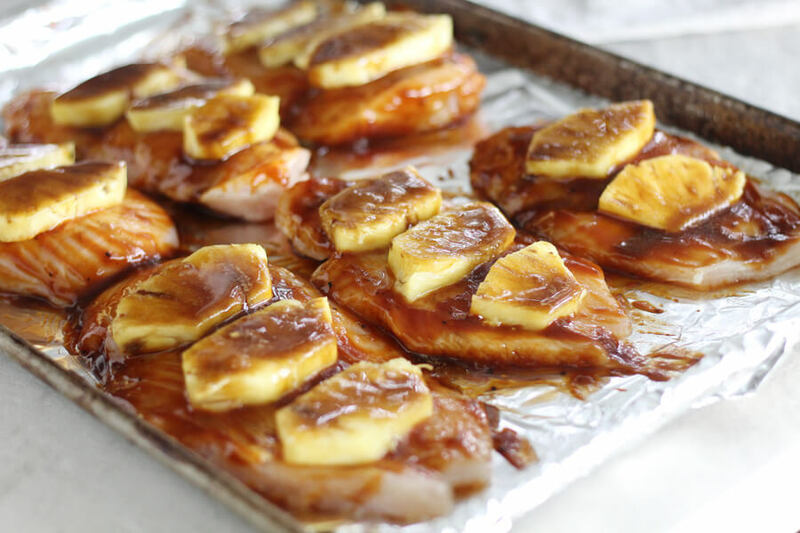 Arrange the pineapple pieces or slices on top of the chicken. 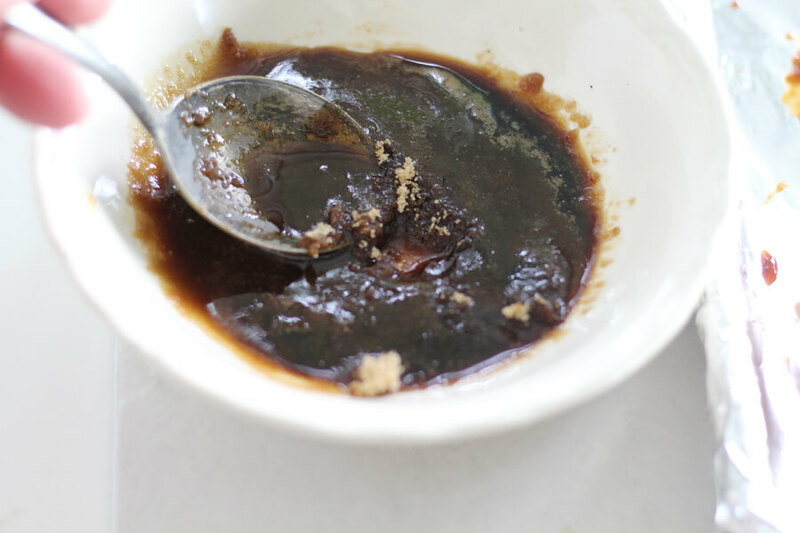 In a small bowl, combine the brown sugar and soy sauce to make a paste. Spoon the mixture evenly over the pineapple. Bake uncovered for 20 minutes. 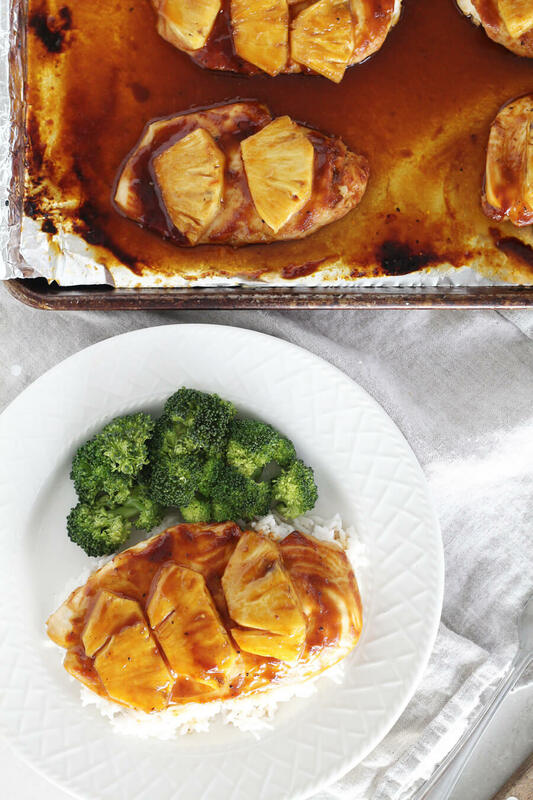 During the last few minutes of baking, baste the chicken by spooning the pan sauce over the pineapple chicken. 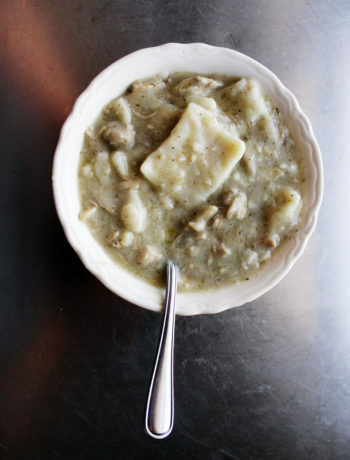 Remove from oven, cover loosely with foil, and rest for 5 minutes before serving.